I love the cozy feeling the holiday season brings. 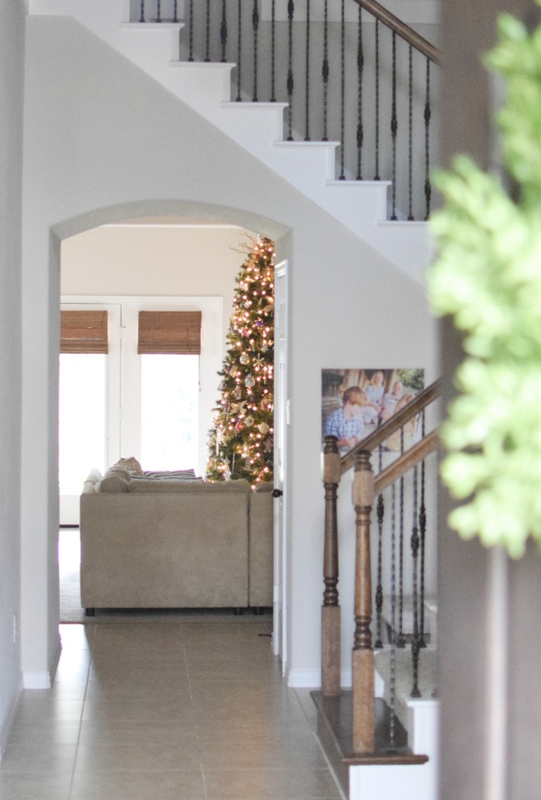 All the pretty lights, garlands, wreaths and ribbons placed throughout our home all in preparation to celebrate Christmas are all so comforting. 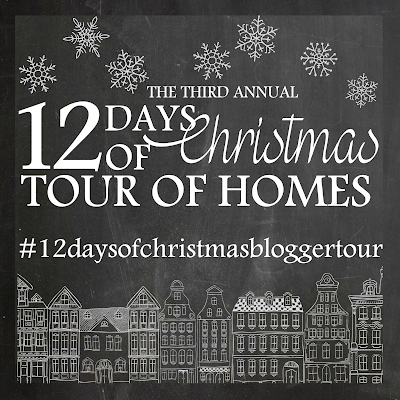 This year I'm honored to be part of the 12 Days of Christmas Home Tours with such a wonderful group of home bloggers. Before I show you my tour, did you happen to see Pam at Simple Details' Christmas Tour yesterday. Her home is so beautiful and her décor is always so gorgeous. 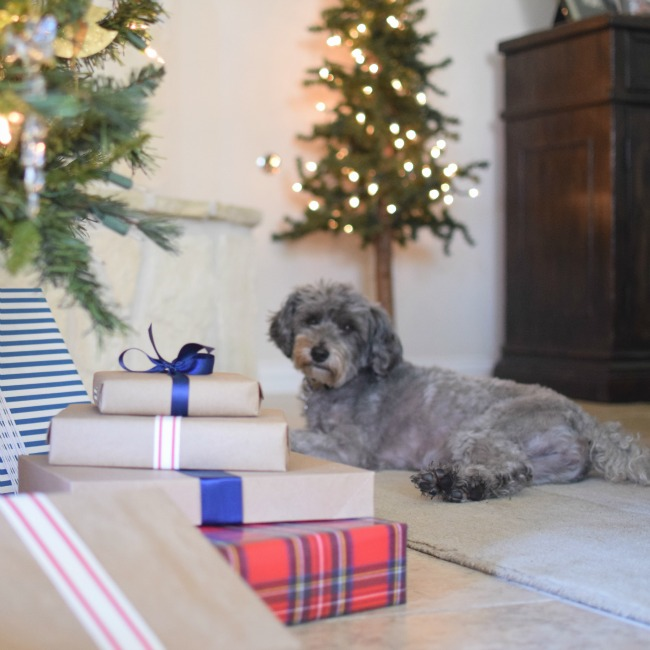 And today, Paige at The Pink Clutch is also sharing her Christmas home tour along with me. You will definitely want to check it out! And for a complete line up of the tours, I have those listed at the bottom of this post. So much inspiration from this talented group. 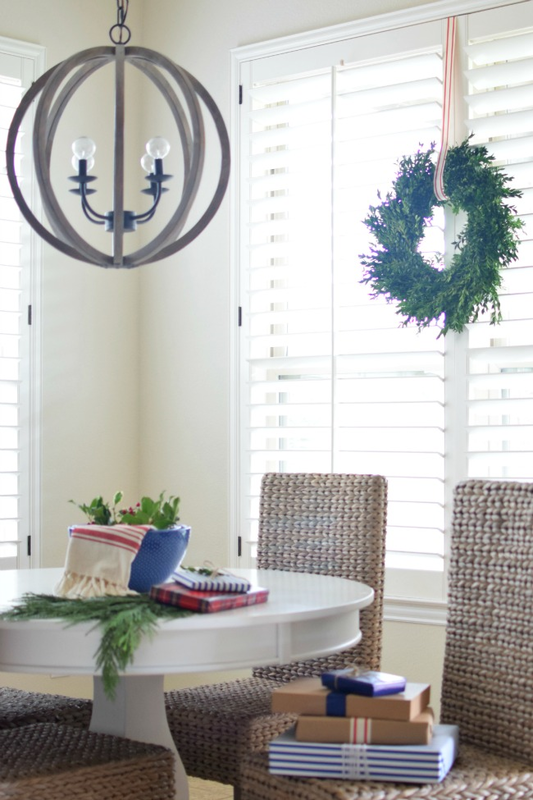 The last couple of years, I've kept my holiday décor fairly neutral with a touch of red. This year my decorating color scheme was definitely influenced by the colors in this gorgeous artwork on my mantel from Minted. You can see a peek of it in the collage above. It's called Folksy Joy and I love the quaint, rustic print the artist created. Framed in the hand carved whitewashed herringbone frame, it added the perfect festive touch to our mantel. So this year I incorporated hues of blues into my holiday decorating and I'm so happy with the change! 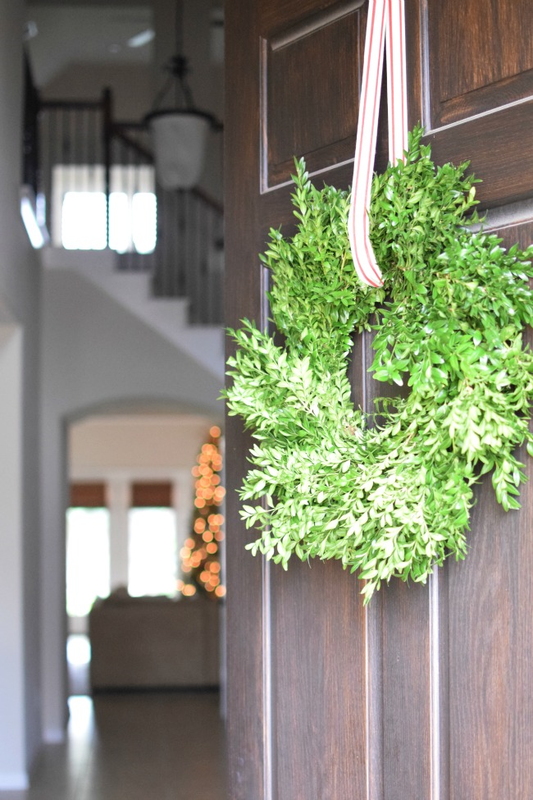 For the front door and porch décor, I used a live boxwood wreath and live pine garland from Trader Joe's. 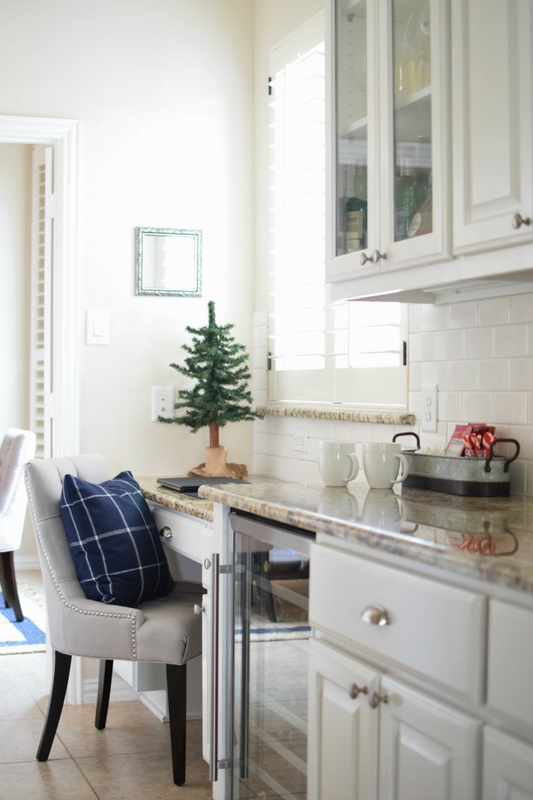 The mudroom and study/piano room are the first rooms you see when you enter our home from the garage or the front door, so I added a little Christmas cheer to each of those spaces. The boots and scarf are a couple of my favorite fashion pieces this winter and have been on heavy rotation. My stockings are from Etsy and the wrapping paper is from HomeGoods. 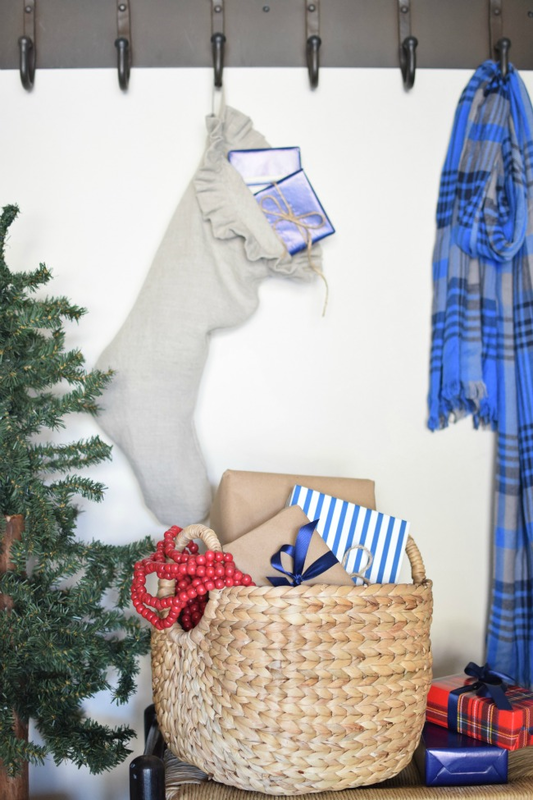 The basket and red wood cranberry bead garland are World Market finds. 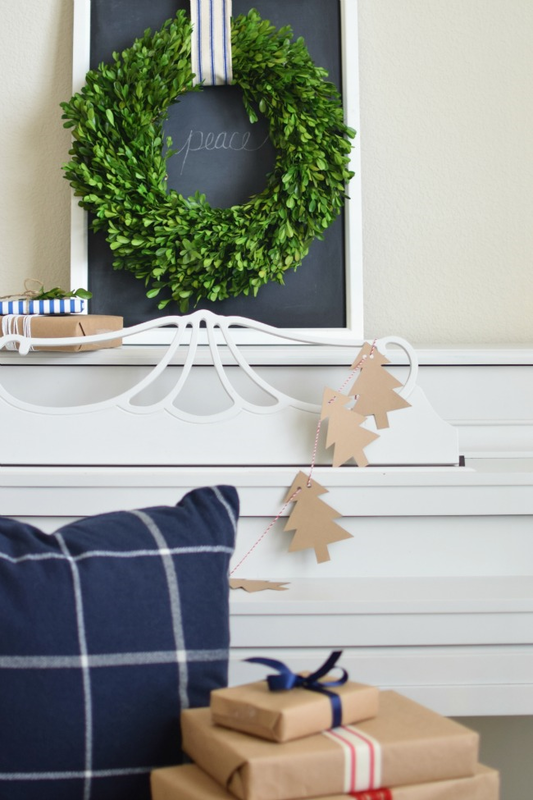 The Christmas tree garland draped on the piano is a simple DIY from last year. I usually like to write a one world message in the center of my boxwood wreath. Last year it was "joy" and this year with all the violent attacks recently "peace" seemed more fitting. Praying for peace. 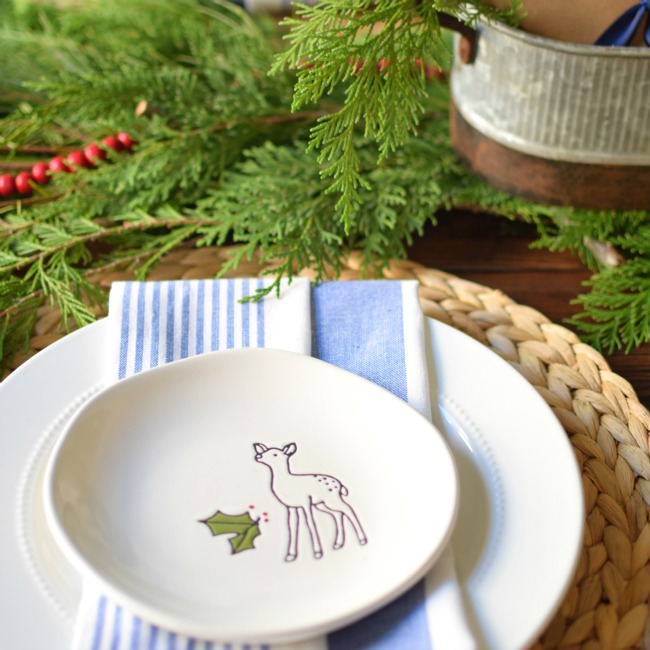 In the dining room I set the table with natural color chargers, simple white dinner plates and these darling dessert plates I found last year at Marshalls. You can see the sweet deer in the picture above. They came as a set of four, each with a different design. I love them! For the center of the table, I used fresh garland, which last a pretty long time especially if I spritz it. 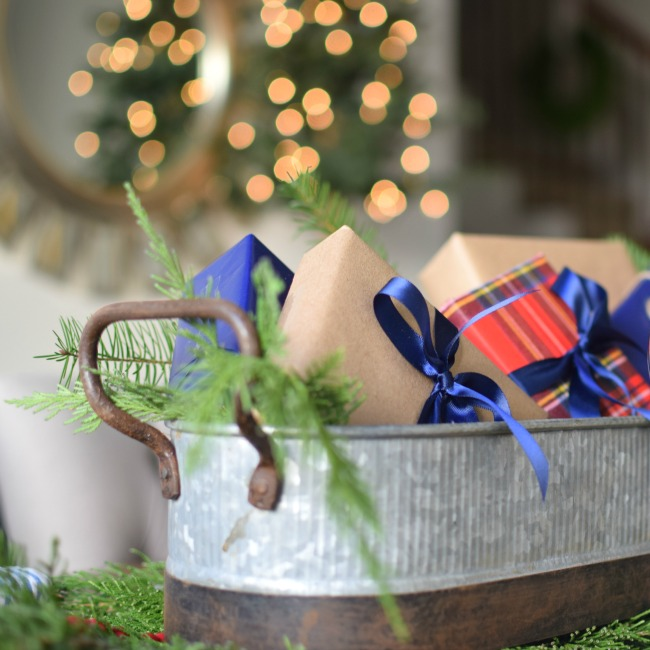 I was a bit stumped on what to use for the center piece, so I went with this rustic galvanized planter that I had from Birch Lane and I filled it with small presents. I continued the blue color in here as well with the blue striped napkins. Moving on to the kitchen, I really kept it the most simple in here. A small Christmas tree, mini wreath and cocoa station add a few festive touches. The navy plaid pillow is a Target find. In the breakfast room I added a couple of live boxwood wreaths on the shutters and a few holly berry clippings in the center. And finally our Christmas tree. It's such a wonderful feeling relaxing at the end of the day near the soft white glow from this tree. 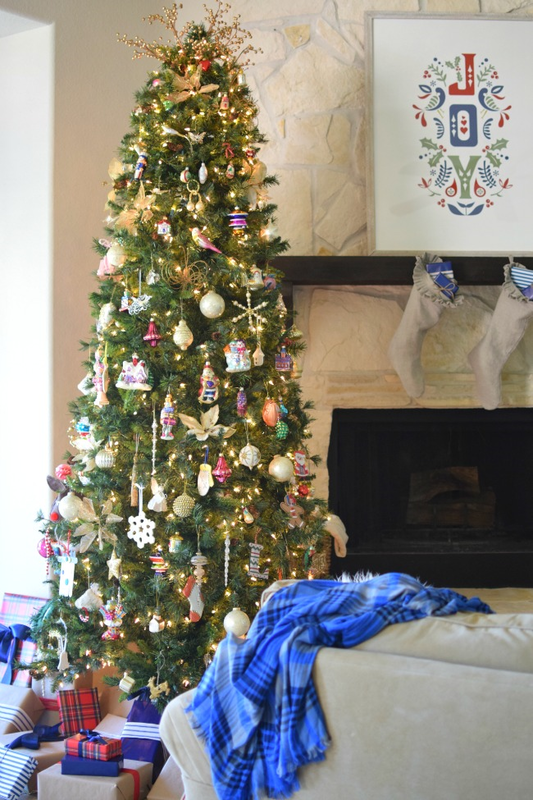 As for decorating our tree, I like keeping it simple. We put all our ornaments on the tree from the homemade ones to the more expensive blown glass ones. The kids love seeing the ones they made or were given, and I love the memories each one holds as we unwrap them. I think it's so pretty and a little more special with them all together. You can get a better look at my beautiful Minted Artwork on the mantel. It tied in so perfect with my home style and décor. So that wraps up this year's tour. Next up on Monday, Lauren from Bless'er House and Amanda from The Tale of an Ugly House will be sharing their holiday homes. And for a complete line up you can see the whole gang below. 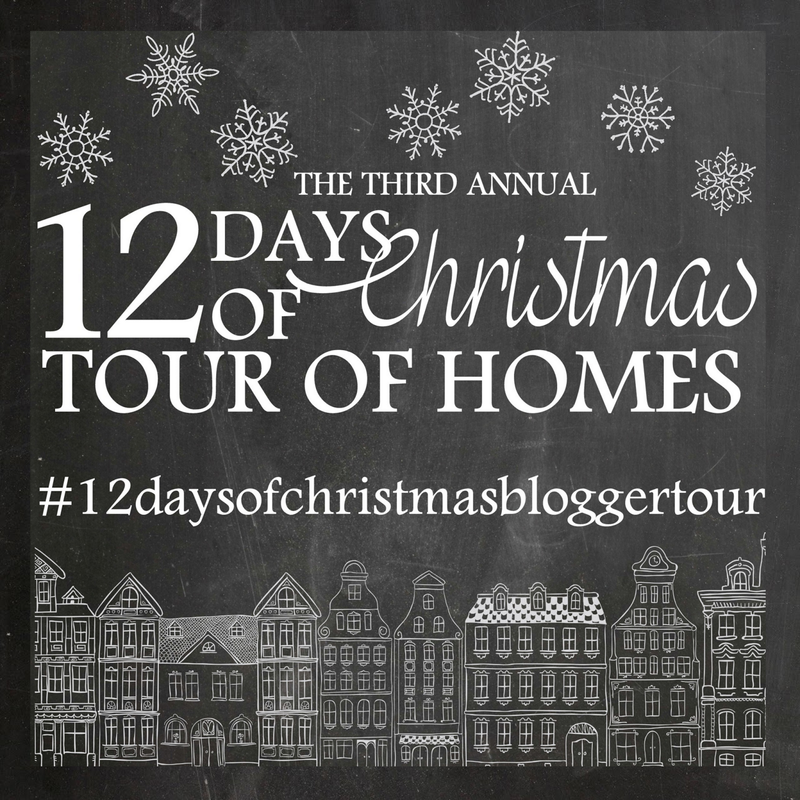 We are also sharing on Instagram under the hashtag #12daysofchristmasbloggertour if you want to follow along there. And finally a huge thank you to Jenny @ Evolution of Style for putting it all together and inviting me. And to Lisa @ Shine Your Light for the beautiful graphics. Becky, it's all so beautiful!! 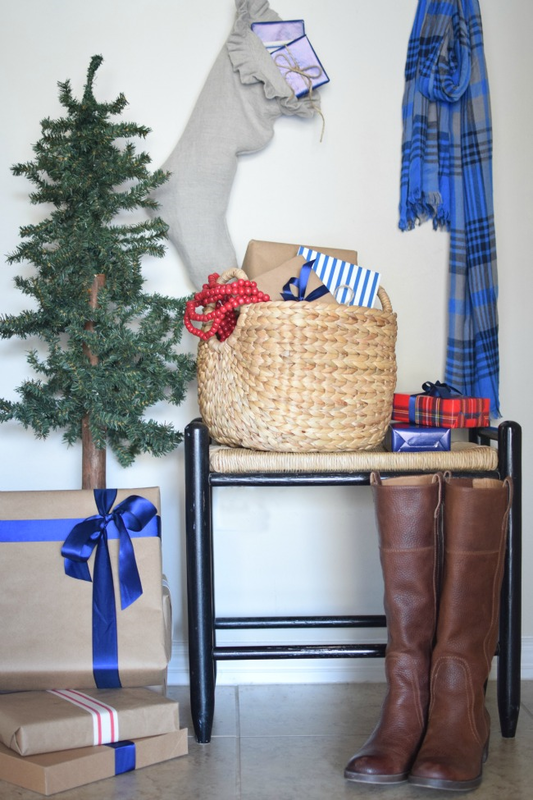 I love your color scheme with the blue and a bit of the red plaid, along with the gifts wrapped in craft paper! 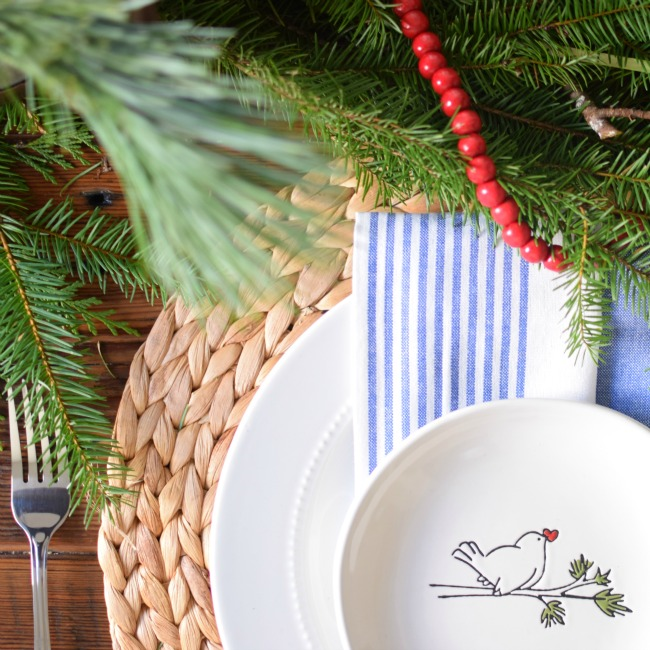 Your simple and festive touches everywhere are so cheerful, I am feeling so inspired! Thanks for sharing your holiday home and I hope you and your family enjoy it this Christmas season!! Thanks Lisa! So nice to sit back and enjoy it all now. Becky, your home looks GORGEOUS! I love the color cues you took from the artwork - it's so fresh and so classic. So welcoming. Thanks so much for joining this year - I love it all - so beautifully done. Thanks Jenny for your sweet comment and for organizing everything!! Absolutely gorgeous Becky! And your photography is amazing too! becky i love love love this! the colors are amazing! you and aniko from place of my taste both used red and blue as your colors and i am totally digging it!!!! Thanks so much Cassie! Loving the change of colors this year!! I haven't seen Aniko's yet...love her...I'll need to check it out! 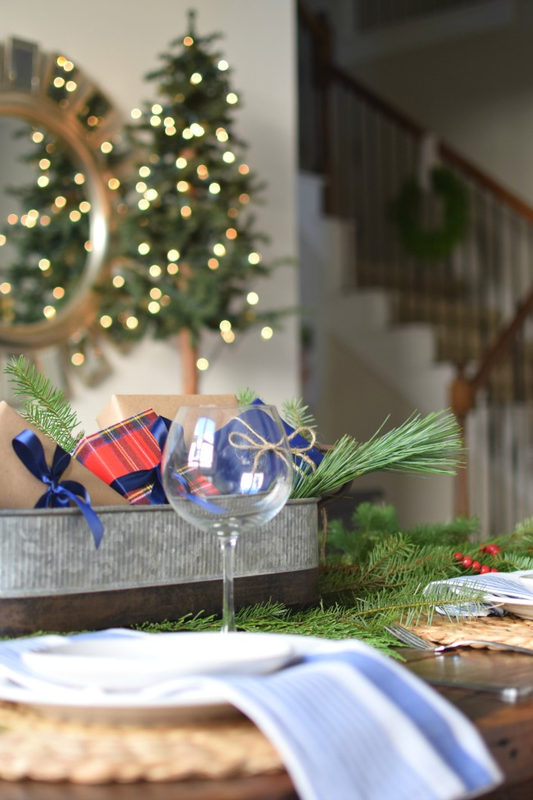 Your home is just so welcoming, relaxing, tasteful and oh-so-pretty even more so this holiday season! 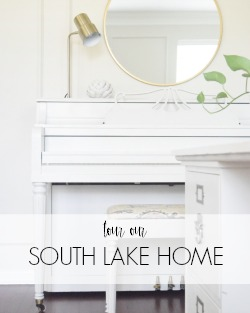 So happy to join you all in this fabulous home tour! 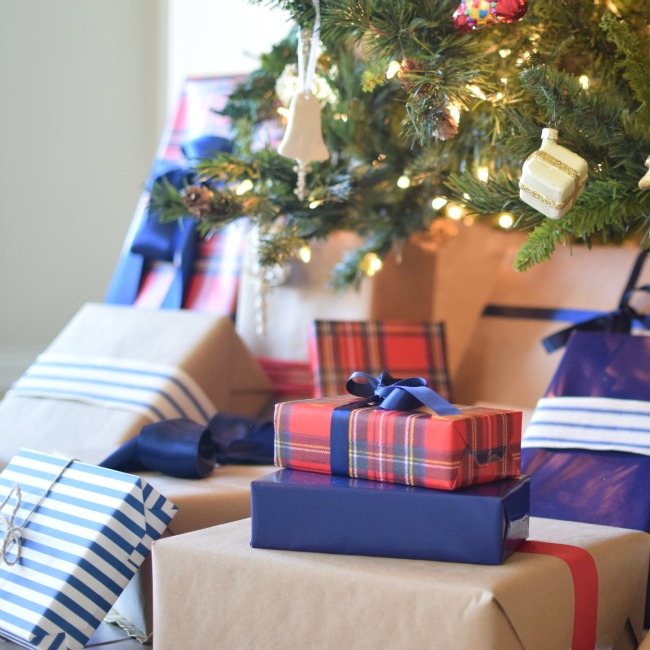 I'm in love with your touches of blue all around, you have made a very special place for your family indeed and no doubt your Christmas will be a very merry one! Cheers! Thank you Vel! It's been fun join you as well. Love the transitional table centerpiece. 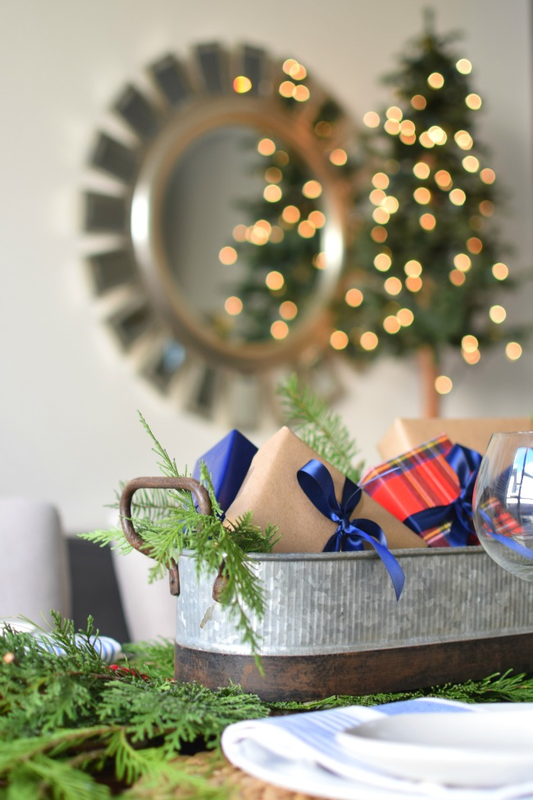 It looked fabulous for Thanksgiving and the wrapped presents are such a fun touch now. 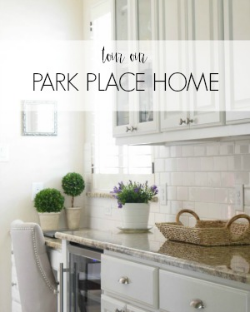 Love the crisp, classic look of your decor. Thanks Cindy! The table did transition well between the two holidays. 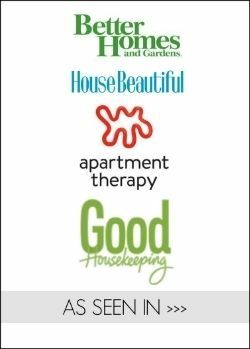 Looking forward to seeing your beautiful home next week! Love your decor and your pictures are perfection too. Thank you Marty! Can't wait to see what you are sharing for the Holiday Open House!! Beautiful Becky! 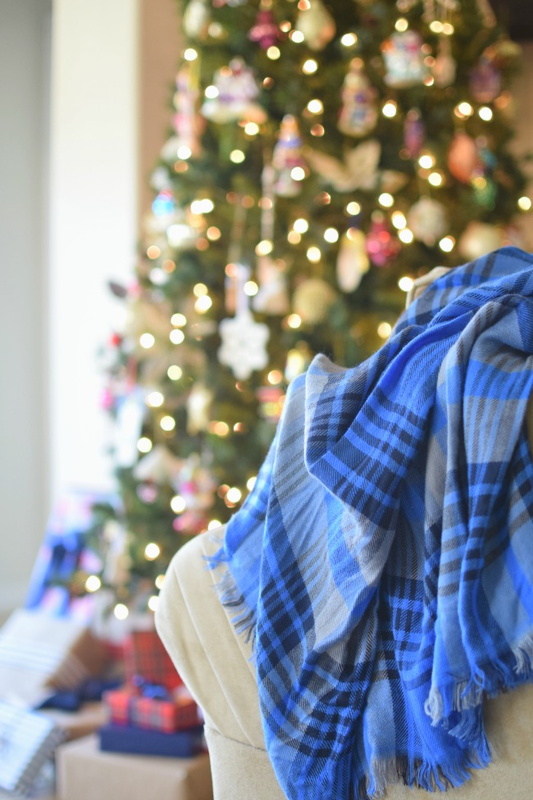 Love the plaid and the pop of blue. You have quite an eye for gorgeous interiors and design. Thank you Lauren. Really enjoying the blue this year. It was a fun change! The blue is gorgeous with the reds and greenery. Don't you just love the Trader Joe's boxwood wreaths? 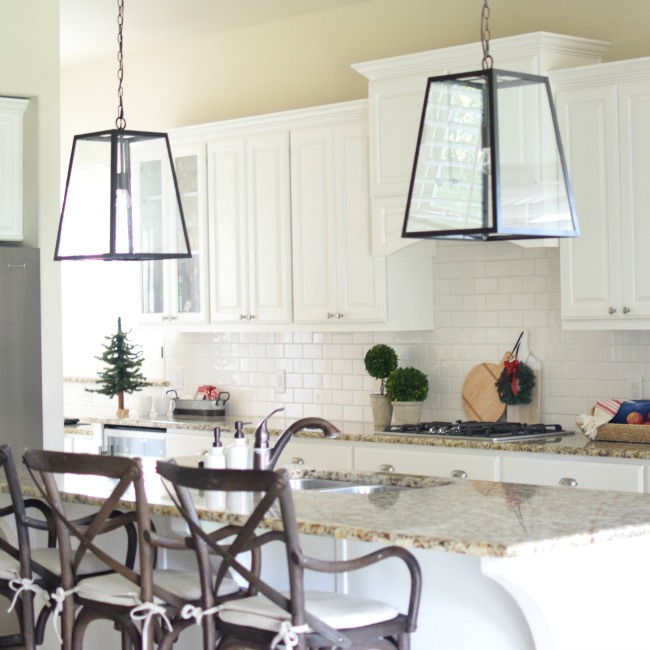 They are so pretty in your kitchen. And I love your table setting...so fresh and inviting!! I am glad to be a part of this with you and get to know you better! Merry Christmas! Yes, Trader Joe's is so great! Such pretty greenery and great prices too! Looking forward to your tour next week! It looks amazing. 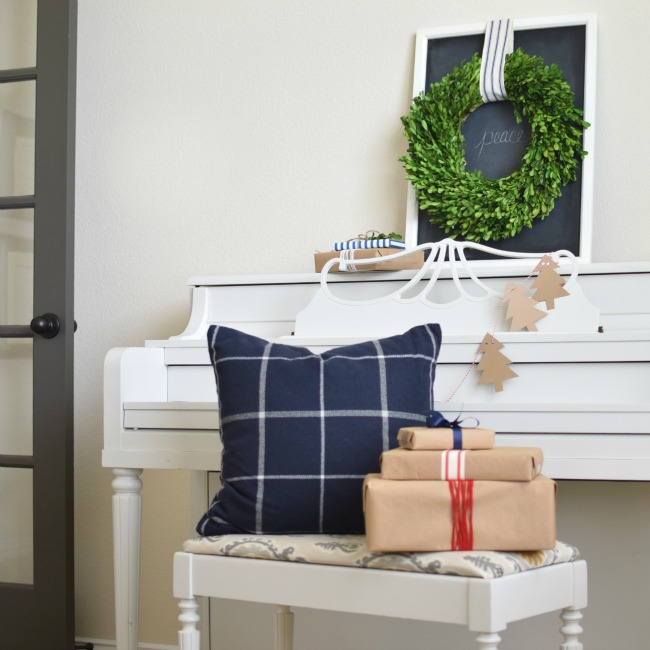 I am loving how you incorporated blue and your boxwood wreath over the piano is one of my faves. Merry Christmas!!! 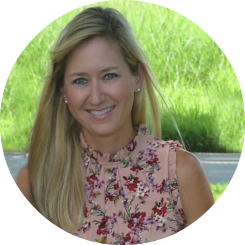 Becky, you have such a great eye for capturing simplicity beautifully! I love the calmness and fresh, crisp look you've created! Beautiful job and wonderful photography! Thanks Pam! Really enjoyed your beautiful Christmas tour as well. Becky, I can't tell you how much I loved the bright blue that you decorated with - it's gorgeous and you flawlessly carried it off throughout your whole home. And I'm definitely snagging some of those World Market beads when I'm there next week. So glad to have you on the tour this year!! Thanks Kris! Happy I got to join you all!! Just lovely! The navy blue was a wonderful choice for an agent color! Gorgeous! I just love all the blue!!! Thanks Rachael! Adding the blue was new this year and it was a fun change. Loved joining you on these tours as well! 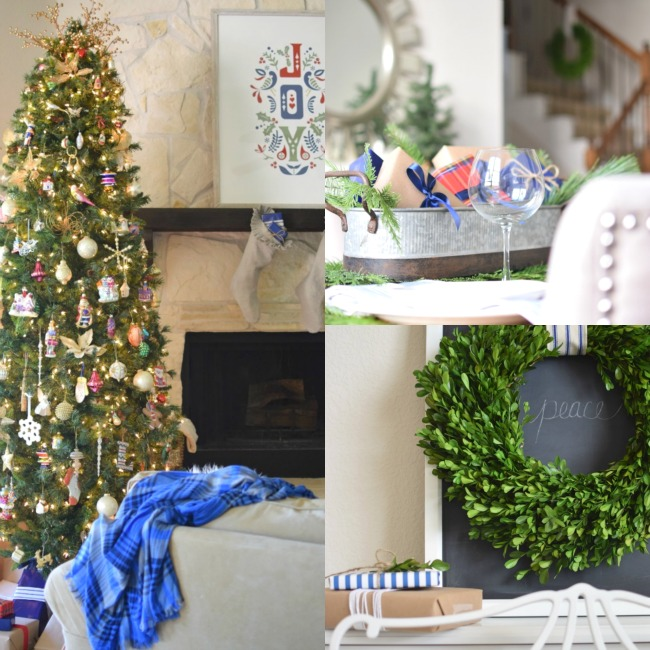 So pretty and festive and I love the use of the royal blue! I'm always drawn to the neutrals too! Your pops of red and blue were excellent additions for your natural palette. Your pictures are truly magazine perfect. So well done! Thank you Katie! Always love your kind comments!! Merry Christmas! What a beautiful home! I love the centerpiece on the table! Did you use upholstery webbing for your front door wreath? I love it!